With so much else to consider when moving house, making the right provision to protect your valuable items can easily be overlooked. However, considering the following questions could minimise any chance of breakage or loss, which could mar the move and cause additional stress. Have you identified your valuable items and kept a record of them? Once you know you are on the move, it is crucial that careful thought is given to the practicalities of transporting valuable items safely. Identifying which of your worldly goods will require special consideration, as well as making sure you have a record of specific details relating to them, is important. Large televisions, computer equipment, heirlooms and antiques, artwork, glass and tableware are just some items you will need to take stock of. Jewellery and important personal documents, such as birth and marriage certificates, also need to be kept safe during the move. Take photos of valuable items and keep receipts or valuation documents, as you will need this proof if the unthinkable happens. What is your removal company’s policy when dealing with valuable items? Before deciding which removal company to employ, it is prudent to discuss the particular aspects of your move with potential firms. This should include finding out about insurance cover and the different choices on offer to you, including any additional services which may be available such as secure, lockable crates, or specialist moving of valuable items such as antiques. Who will pack your valuable items? You will need to decide if your valuable items will be packed by you or the removal company. Remember to ask about the availability and provision of boxes, tissue paper and protection blankets, as these items are essential, particularly if you are packing for yourself. 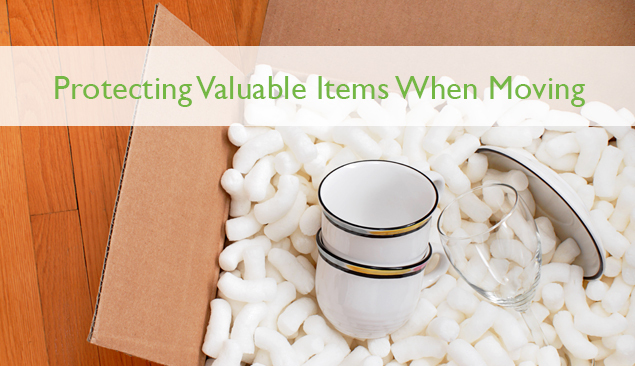 Have you decided to transport any valuable items yourself? Whatever arrangements you have decided about packing, there are likely to be some possessions which you will want to take personal responsibility for transporting. Jewellery items and, perhaps, personal documents, including details of your valuable items, are easily portable, and may also be considered too important to send on the removal van. These items need to be packed carefully and labelled clearly. One person should take responsibility for their safety. These items should not be left unattended, and need to be kept secure until they are safely stowed away in their new home. Moving home can be stressful but even the most valuable items usually arrive safely at their new home. Careful planning and preparation will make it more likely that your most precious possessions are transported without a hitch.